Drive at night unlike golf carts! Only company with gas or electric LSVs! 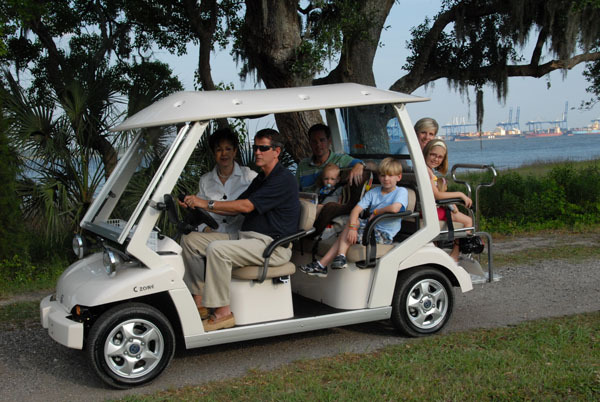 Lightning Bugz Rentals provides affordable, eco-friendly Low Speed Vehicles and Charleston golf cart rentals to vacationers and commercial businesses. We take the hassle out of getting around your destination. Whether it is going from your rental property to the beach, wedding and event set-up and transportation, or property maintenance needs, we have a Bug just for you. We provide LSV and golf cart rentals in Charleston, Isle of Palms, Sullivan's Island, Folly Beach, Kiawah, and Seabrook. We also serve Anna Maria Island, Florida! Vacations are the ideal way to spend time with your family. We also know the burdens of getting out of the house and to the beach with all of your personal items. Our Vacation Rental Bugz can safely accommodate 4-8 passengers, is car seat friendly, and has storage capacity for those cumbersome beach chairs, coolers, and toys. An LSV is street legal, can be driven at night, and is the perfect way to cruise around to the grocery store, area attractions and the beach. With a Lightning Bugz LSV you no longer have to worry about parking a large vehicle, waiting for the A/C to cool down your car, high gas prices or sand in the carpet! Lightning Bugz LSV also has a commercial line with a variety of Electric Utility Vehicles. Our fleet is ideal for municipalities, apartment/condo complexes, weddings and events. Typical usage includes area security, grounds crews, VIP transportation, and event set-up/tear down. Our Commercial rental program is customized to each client. Contact us today with any questions or visit our Business Programs Page for options.